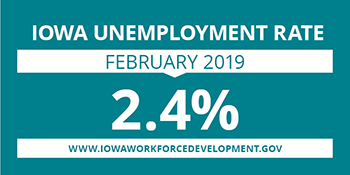 The number of unemployed Iowans decreased to 40,000 in February from 40,600 in January. The current estimate is 6,100 lower than the year ago level of 46,100. 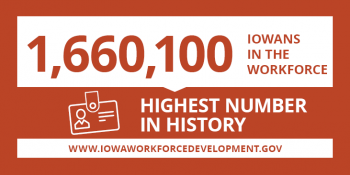 The total number of working Iowans increased to 1,660,100 in February. This figure was 5,700 higher than January and 25,500 higher than one year ago. In February, Iowa establishments cut payrolls leading to a drop of 5,500 jobs in total nonfarm employment. This was the first monthly drop since September and fueled by losses in private services. Unusually cold and forbidding winter weather may have had some influence on payrolls. Both construction and leisure and hospitality had losses this month. Private sectors accounted for most of the drop this month (-5,000); however, government also decreased slightly due to losses at the local level (-800). Compared to last year, government is now down 1,900 jobs due mostly to cutbacks at the state level and Iowa total nonfarm employment combined is up just 5,800 jobs (+0.4 percent). Leisure and hospitality pared the most jobs in February (-2,400) with virtually all of the losses stemming from accommodations and food services. Eating and drinking establishments contracted this month, but should rebound in March when the weather supports more traffic and with regional basketball tournaments in the Des Moines area. This super sector has displayed mixed signals over the past several months and shrank slightly versus last year. Trade, transportation, and utilities shed 1,500 jobs due mostly to declines in transportation and warehousing (-900), although retail continued to trend down in February (-700). This was the first monthly loss for this super sector since October. Smaller monthly losses this month included professional and business services (-900), construction (-400), and education and health services (-300). Only three sectors added jobs this month. Other services added 400 jobs to lead all sectors. The financial services sector gained 200 jobs but has shown evidence of tapering down following expansion over the past several years. Natural resources and mining added 100 jobs. Compared to last February, manufacturing continues to lead all sectors in job growth (+8,400). All other super sector gains are small by comparison and include professional and business services (+600) and construction (+400). The largest notable losses in Iowa’s economy occur in retail trade (-3,000) and accommodations and food services (-1,700). MEDIA ALERT: Local data for February will be posted to the IWD website on Tuesday, March 26, 2019. Statewide data for March 2019 will be released on Friday, April 19, 2019.